Hiya guys! I was so surprised and happy at how many of you thought my bat-camo nails were not a fail yesterday. Definitely brought a smile to my face so thank you for that. Today I am bringing you another spooky look for Halloween. 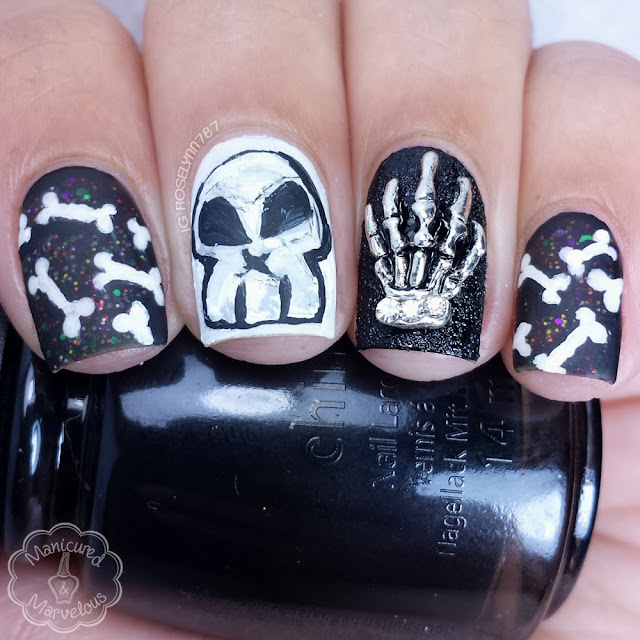 I can't believe I didn't do a skull-related mani up till this point, I mean skulls are like the classic symbol of spook! Well to be honest, I didn't because I was afraid to even attempt drawing one. It's one of those things that seem simple, but once you try it feels like a failure. But these are definitely not a nail fail to me, I actually really love the look of these. I ended up drawing the bones in the same way I would doggie bones. In retrospect, I think they ended up turning out a little too cutesy in contrast with the more grunge feel of the skull. What do you think? The base for my pointer and pinky nail is called Bump in the Night from CDB Lacquer. I totally had to matte the dark crelly to fit with the grunge look of this mani. Okay, okay I didn't have to but I love the matte so much haha. I freehanded the bones and skull using a detail brush and acrylic paint. On my accent nail I used a black textured polish from Sally Hansen called Lick-O-Rich. The totally spooky skelly hand charm is from one of my favorite shops Daily Charme. 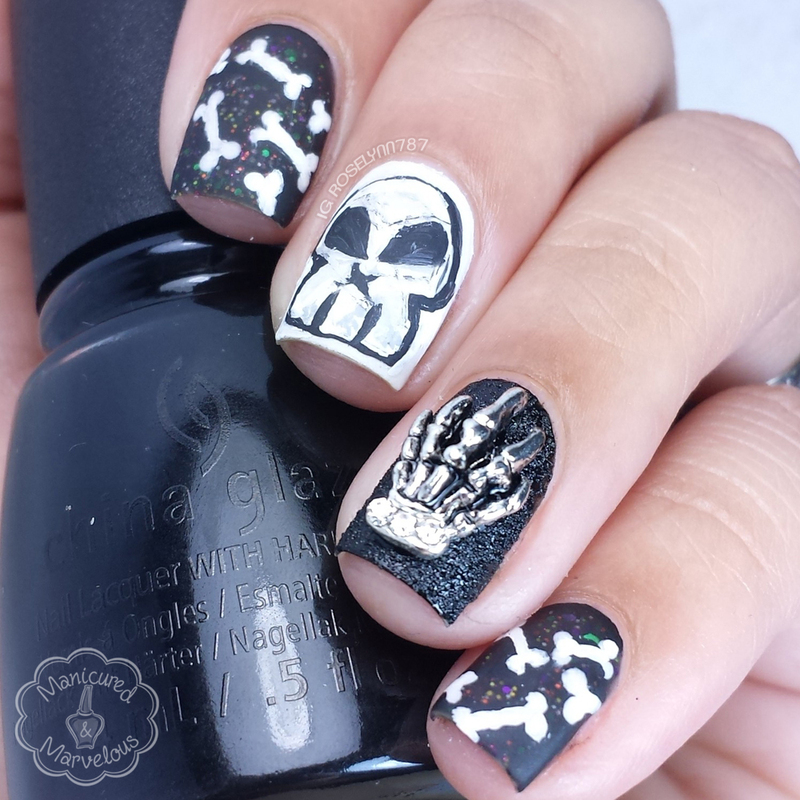 The funny thing about this mani is that this was my third attempt at trying to do a skull. Going into this mani I knew I wanted to use this skelly charm, so naturally it needed to be accompanied by a skull. Well my first two attempts came out super weird, just completely bad. I decided to call it a night and the next day I tried it again. Thank the art gods for acrylic paint! In the end, I'm really happy that I kept at it until it turned out exactly how I wanted. And that's the thing about freehand art, sometimes you just have to walk away in order to clear your mind. You can't force something to look good, you just have to practice until it just clicks. But tips and tricks always help a long the way of course! Do you guys have any to share? 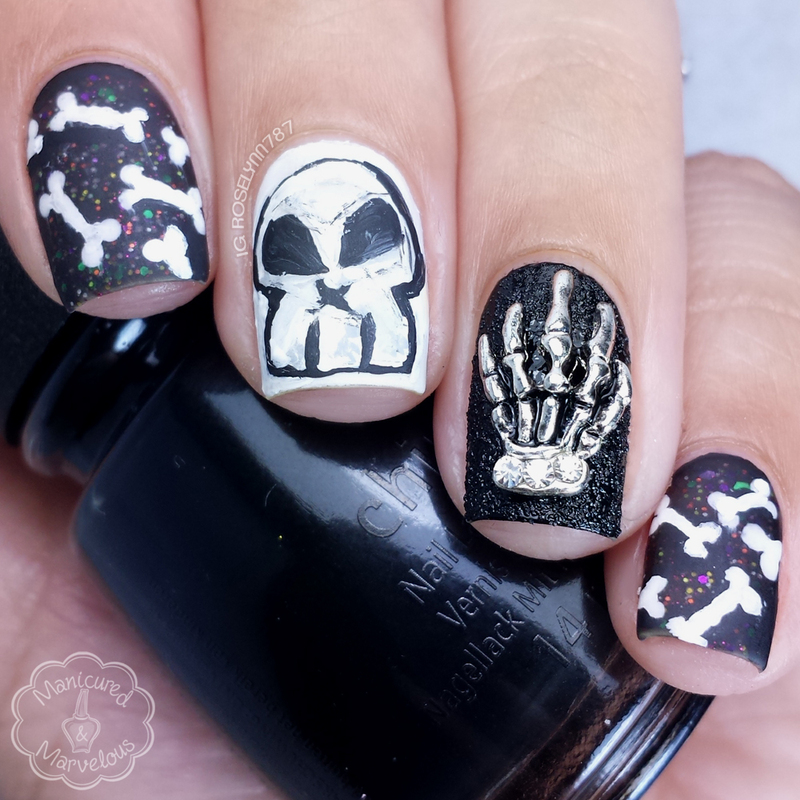 I really like this mani, the bones are a little cutesy but not overly. That skull is badass though! Over all I'm loving it! That CDB Lacquer! Love the colorful sparkle <3. This is an awesome mani! And can we stop to talk about that skull for a second?! Fantastic! I adore the pinky and index fingers! The skull is spooky! And that big charm is so scary, I love how it looks that someone is trying to grab your nail if it makes sense! This is very cool. Matte-ing the crelly was definitely the right decision! I love that skeleton hand charm! That skull is amazing! I quite like the cutesy bones! It adds an interesting twist to the more spooky skull. That charm is so creepy, I love it! And the rest of the mani fits perfectly with it, so beautifully done! This mani is perfect!! Love how it turned out!